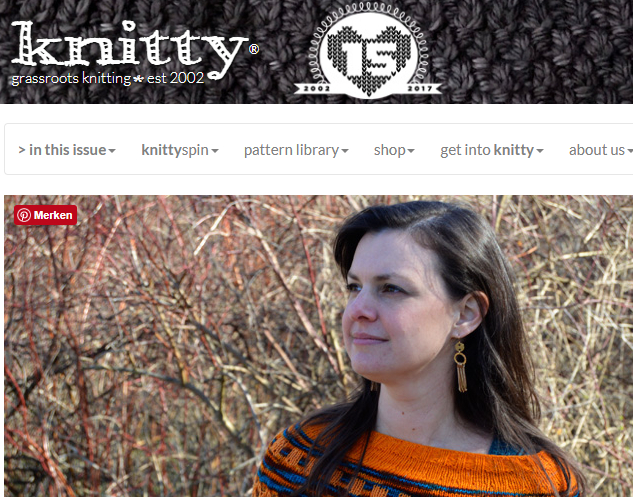 I’m sure most of you have noticed it by now: The new Knitty is out! This is the Deep Fall issue, so we get a lot of patterns suitable for the cooler temperatures. And this is also the 15th-anniversary issue, so all patterns in here should be inspired by something published in the Knitty issues of the last 15 years. I think this issue turned out very well. As always there are many things I wouldn’t knit in here. But this time I find the designs overall a lot more interesting and fun as in many previous issues. Even if something wouldn’t make it on my to knit list, I still always liked something about it. I believe, there is a lot of variety this time and I am sure most knitters out there will find something to knit in this issue! 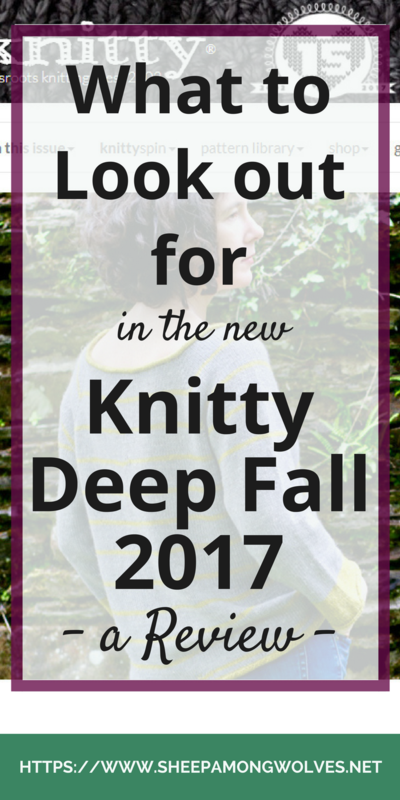 So without further ado: Here is my review of the Knitty Deep Fall 2017 issue! This is a very simple A-line raglan sweater with thin stripes. It is originally meant to be worn as a very oversized sweater (5 inches/12.5 cm of positive ease). But I would knit it in a smaller size for less positive ease. I do like some room in my sweaters but not that much. It’s a great layering piece for fall. You could wear it over a shirt or blouse or just with jeans. It seems to have rolled edges for the hem and sleeves but you could easily change that to something that suits you better if you like. The neck bind off looks like an i-cord at first glance but it actually a rolled hem. Again that can easily be modified if you are so inclined. You might enjoy knitting this if you like basic, comfortable sweaters that you can wear to almost anything. If you don’t mind knitting a lot of stockinette and are already well entertained by knitting a few stripes. You might not enjoy knitting this if knitting a lot of stockinette bores you and even the stripes won’t be enough to entertain you. You dislike rolled edges and never adapt a pattern to better suit you. My verdict: I know I’ve said before that lots of stockinette bore me. And it does. But I do like this sweater and definitely want to knit this! I would modify the cuffs, the hem, and the neck bind off to simple ribbing probably. Rolled edges annoy me, especially on sleeves. This is a nice everyday kind of sweater that you can wear pretty much anywhere. And it looks very comfortable. This is a pretty cowl that combines a lot of techniques into one single knitted item. It has very simple stranded colorwork rectangles, a very pretty slipped stitch pattern and some lace. The designer’s inspiration was the hat Vinter Lue of the fall issue of 2002. And you can easily see the different patterns incorporated into this cowl. The lace mimics the diagonal color stripes on the hat and the slipped stitches outline the negative space between the hourglass shapes in the middle of the hat. The rectangles could be a simplified version of the third stitch pattern. It’s definitely a creative and fun reinterpretation! You might enjoy knitting this if you like knits with a lot of variety to them but still want them to be easy and relaxing. You might not enjoy knitting this if you dislike slipped stitches, lace or stranded colorwork if its simple. My verdict: I like this cowl very much. The colors aren’t mine but I think it’s a very fun little knit. My only problem is that I wouldn’t know when to wear it. The shape really makes it more of a cape or very tiny poncho as a cowl should normally be able to keep your neck warm and not just your shoulders. Fall here is windy and often wet and grey and can be quite cold. I would have to alter the shape of the cowl a bit at least make the neck longer for extra warmth. But I might just do that. Glaswegian is a pretty stranded colorwork cardigan with patterned yoke, cuffs, and hem. It’s a very classic and feminine design. The yoke shaping includes both decreases and short rows. And you knit is rows which means you will have to knit the stranded colorwork on the wrong side as well. Or learn how to knit backwards. At least there are no long floats that would have to be caught from the looks of it. You might enjoy knitting this if you’ve knit colorwork before and keep relatively even gauge in it even when purling. And you don’t mind knitting colorwork on wrong sides. You might not enjoy knitting this if you’re new to colorwork. And you keep forgetting to read the chart from the other side when purling back. My verdict: Very pretty. I sure would love to wear this cardigan. The suggested yarn doesn’t sound like I would like it but there are plenty of alternatives to choose out there. This would be right up my alley. Alicorn is a simple yet elegant cowl featuring a lace motif (it looks very similar to the one in the Nutkin socks, actually) that is supposed to remind of a unicorn’s spiral horn. Hence the name. 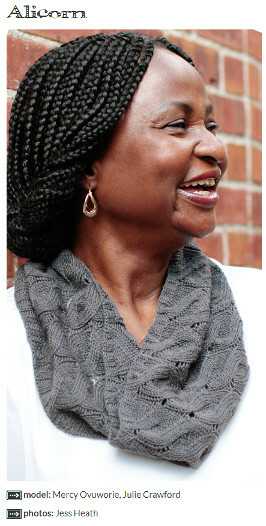 Two sizes are available for either a more close fitting or a looser cowl that could be wrapped around the neck twice. You might enjoy knitting this if you like lace or are a beginner lace knitter – the chart is simple and easy to follow. If you have a skein or two of some very luxurious yarn you’d love to have close to your neck. The pattern uses only around or up to 300 yards for the smaller size. You might not enjoy knitting this if you don’t like (knitting) lace. Or if you don’t wear cowls and don’t know anyone who does. This cardigan was inspired by Laura Nelkins first Knitty pattern Abrazo. It incorporates her Novus construction for sweaters. A beautiful cable panel runs vertically down the back but the rest is knit side-to-side and entirely seamless. 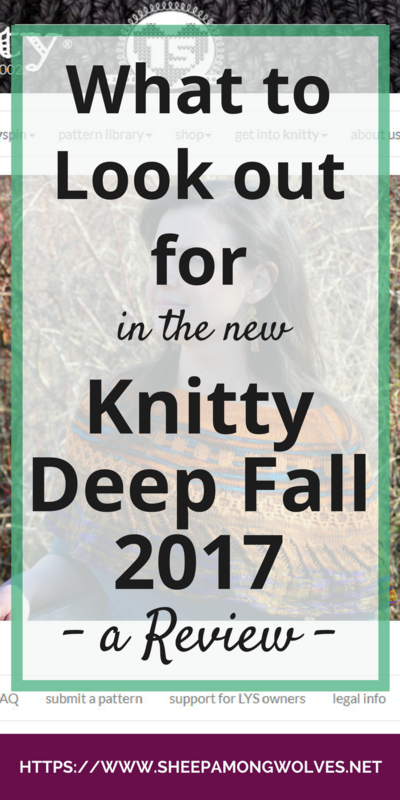 You might enjoy knitting this if you want to try something new and like knits in a bulkier yarn. You might not enjoy knitting this if you have trouble understanding constructions that aren’t straight top-down or bottom-up. If you never knit gauge swatching and always try things on as you knit. My verdict: The cardigan is pretty if you look at the back of it. But I don’t like the front or the closing. Also, as I’ve said before I don’t like knits in such bulky yarns. And the sleeves are too short (which could be easily rectified). But the construction interests me. I looked at the other Novus sweaters and there is one I really like that I would prefer to knit: Gola. This is a cocoon with a nice lace stitch motif knit in bulky wool. It’s a simple knit and great to practice lace knitting with. You might enjoy knitting this if you want to practice lace knitting on heavier yarns because you find fine yarns to fiddly. If you like the shape and would wear it. If you are living somewhere where fall is warm enough to wear this instead of a jacket. You might not enjoy knitting this if you don’t like to seam, don’t like lace or don’t like bulky yarns. If you don’t like the shape this creates. My verdict: I like the lace stitch motif and the color but everything else isn’t for me. Might use the lace pattern on something else in the future, though. This skirt was originally designed to be a sweater but Jeane deCoster didn’t like the fit, so she converted it into something else. That in itself is a pretty cool idea. And the skirt really does look like it was supposed to be a cardigan. It is a stranded colorwork piece knit in the round with a steek. It is a nice piece to practice stranded knitting with multiple colors and catching floats with. You might enjoy knitting this if you feel like practicing your colorwork knitting and like skirts that draw the eye. You might not enjoy knitting this if you dislike knitting long rounds (depending on the size up to 400+ stitches) and don’t like the usually a bit more rustic yarns recommended for knitting fair isle with. My verdict: I love this piece. It looks great, I like the gauge and it’s a very fun piece! I won’t be knitting it, however. As a bottom heavy person this just wouldn’t suit me I’m afraid. This is a wrap-around skirt that you could also wear as a shawl. It is inspired by both the ever popular Lanesplitter skirt and Nymphalidea shawl – that mix works really nicely. It’s a whimsical skirt and looks very fun even when worn as a shawl. You might enjoy knitting this if you like the whimsical, colorful style of the skirt and like wearing knitting skirts that (again) draw the eye. You might not enjoy knitting this if you don’t like knitting even easy lace, wear no skirts or shawls or don’t like things that stand out. My verdict: This looks like so much fun that I might just knit it even though I don’t normally wear knitted skirts (see my above statement about being bottom heavy) or things that really stand out like that. I don’t like being the center of attention but I still like this skirt/shawl. Habanero is a long flowing cardigan that flares at the bottom sporting a deep V-neck and a fitted waist. You get to knit a bit of easy lace, raglan shaping, dart increases and it’s rounded up with some clean garter edges. It was inspired by Laura Chau’s first Knitty pattern Serrano, a shorter fitted cardigan, also knit in a fiery red yarn. You might enjoy knitting this if you like long fitted cardigans and don’t like to sew any seam. You might not enjoy knitting this if you don’t like knitting very big pieces or don’t like knitting with bulky yarns. My verdict: I don’t like knitting with bulky yarns or wearing items made with them. Normally. But this cardigan doesn’t look like it’s been knit with a thick yarn. It’s very pretty, flowy and feminine. I really like this design. A hat and a cowl make up this set. Both knit in a colorwork technique without floats where you trap the unworked strand each time you knit more than one stitch in the other color. This is said to have more stretch than normal stranded colorwork fabric because you don’t throw/pick the unworked yarn, you don’t even hold it in your hand but just let it hang and drape it over the working yarn as needed. There is a video of the technique of the Coast Salish knitters linked in the pattern notes. This set was inspired by designs found on Cowichan sweaters. You might enjoy knitting this if you like trying something new or normally have problems with too little stretch on stranded colorwork. If you like heaving a thick and warm hat and cowl set for a cold fall or winter season. You might not enjoy knitting this if switching the yarn in your working hand every few stitches or having to drape the non-worked yarn over the other strand ever so often might annoy you. If you don’t like knitting more slowly than usual (this technique does not sound fast). My verdict: The set is very pretty, though (you’ve guessed) too bulky for my taste. But I might try out the technique and stitch pattern or even convert this to knit it with a finer yarn. I always like to try out new things. And this technique may be slower to knit for me but might possibly help me getting colorwork socks to fit over my heel and around my calf without me messing with the pattern much. The first pair of socks in this issue! 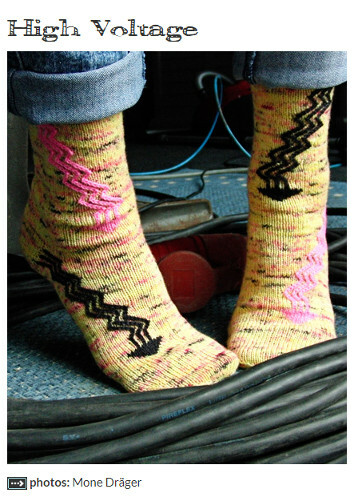 These have a very bold arrow arcing down the sock (like those on “High Voltage” warning signs) and are just plain stockinette otherwise. The arrows are formed with duplicate stitches and vertical stranding. You might enjoy knitting this if you like knitting socks and are always looking for something new to try in that regard. If you have some boldly colored but mostly solid sock yarn lying around that you haven’t found the right pattern for yet. If you keep a stash of sock yarn left overs. You might not enjoy knitting this if you don’t like embroidery of any kind (like duplicate stitch). If you don’t like fussy knits where you need to sew in a lot of ends. My verdict: MUST. KNIT. THESE. This has got to be my favorite design in this issue and as soon as I get my stash organized I’ll be looking for yarn for these! Another pair of socks! Believe it or not, these were inspired by Cookie A. Monkey pattern. The stranded colorwork mimics the triangle shape of the stitch pattern used in the Monkey socks. This is a really beautiful interpretation of that design. And they come with a nice stitch pattern on the sole as well as a colorwork “seam” to avoid a jog. You might enjoy knitting this if you like stranded colorwork and have knit it before and know you’ll get those socks to fit. My verdict: I love them. Which is not surprising, I love colorwork and I often love Rich Ensor’s designs. But I likely won’t knit them. As I’ve stated before I usually have problems with the fit of sock knit with stranded colorwork; they get too tight and I can’t get them over my heel or get them to fit around my calf without messing with the pattern. If I can find a way around that I might knit these. They really are beautiful. Another sweater that really stands out. With big stripes and a big open shark’s mouth decorating the front this really is something else. Embroidery is used for the text and the shark’s teeth. 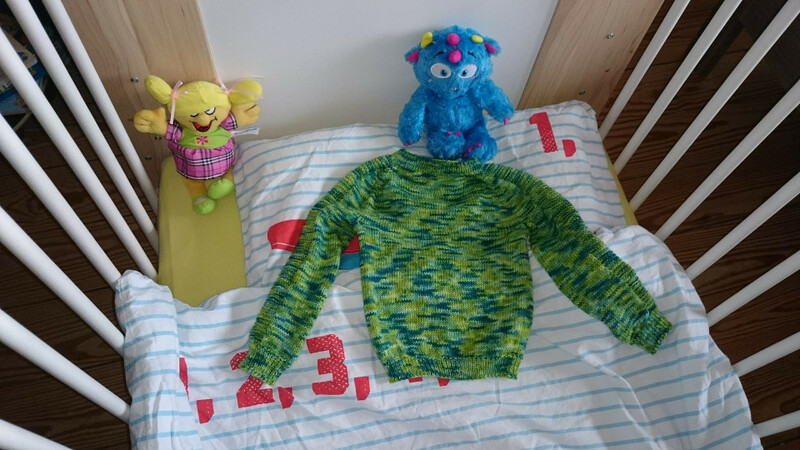 You might enjoy knitting this if you like bold print shirts and want to have a similar design on a knitted sweater. You might not enjoy knitting this if you don’t like knitting intarsia or don’t know any adult who would wear this. My verdict: This is definitely another fun design. I wouldn’t wear this, however. I wear geeky T-shirts almost every day but my sweaters are usually a totally different style. If it were available in a kid’s size as well (4-year-old) Little Wolf would totally get a kick out of this – if I would knit it in cotton. Everything else is “too itchy”. What’s that German saying? “Der Titel ist Programm.” Meaning the name tells you what makes this design unique. It is certainly funky. And whimsical. A very long cardigan (more like a coat) with a lace motif on the back and cables following the shape of the waist. The front edges were elongated with short rows for some pointy corners. The large collar looks a little like a hood on the pictures and sleeves, pockets and bottom hem have lace sewn to the edges. It has been knit at a looser gauge for more drape. You might enjoy knitting this if you like the whimsical nature and like variety in your knitting. If you don’t mind knitting very large pieces. You might not enjoy knitting this if you dislike knitting at a loose gauge, dislike sewing or this design has just too much going on for you. My verdict: I would never wear it but it really suits the model very well. And it’s certainly a very creative design and very pretty in its own way. It’s one of my favorite designs – even though I’d never knit it. This is not a knitting pattern but instructions for weaving a small tabletop rug. I haven’t woven anything since my childhood, so I can’t really say anything about this. But I like that there is something for weavers in the Knitty as many knitters happen to be “multi-craftual”. Lots of knitters spin, or crochet, or weave or dye yarn or do other things related to fibers. I think it’s a great idea that the Knitty mirrors this Reality by offering more for other fiber related crafts. The first and only pair of gloves in this issue. Fingerless and with a short cuff, they have a nice leaf-like design mirrored on the second glove. You might enjoy knitting this if you like quick knits, knitting through the back loop and have a small amount of worsted weight yarn lying around that you’ve wanted to use up. You might not enjoy knitting this if you dislike purling or knitting a small diameter with worsted weight yarn. My verdict: I like the design, it’s very pretty. But I don’t like to wear such small fingerless gloves made from worsted weight yarn. Too bulky for my hands. I think this was a really well-rounded issue. Lots of very different pieces, using different techniques, yarns, and styles. And there were some very creative designs in this issue. This was definitely the great issue for the 15th-anniversary-celebration of Knitty! Unfortunately, not all designers stated what had inspired their designs or in what way their designs were influenced by something previously seen in Knitty. I personally find that very fascinating and would have loved to read more about that. But overall I loved this issue. A big thank you from me to the Knitty team and the designers for putting out so many such wonderful designs for free once again. What was your favorite thing about this Knitty issue? Will you be knitting any of the designs or have already cast on? Was there something you didn’t like? Please let me know in the comments below. Finally done writing this. My longest post so far. When I saw the Knitty had come out I dropped what I was previously working on (tubular cast ons and bind offs, but you can read about those here soon) and immediately knew I would have to write a review about it. I hope you liked reading my review. And I hope to see you again soon here in my home away from the wolf’s den!